Calla lilies, members of the genus Zantedeschia, although called lilies, they really are not lilies. Members of the Araceae family of flowers, they actually are related to anthurium and spathiphyllum (Peace Lily), Arum plants. Calla lilies are associated with the Greek Goddess, Hera, and they represent purity, holiness and faithfulness. So fitting for wedding bouquets and boutonnieres! One early calla lily meaning originates in ancient Greek culture, where the flower was thought to represent magnificent beauty. This origin stems from a tale regarding Hercules as a baby. His father, the Greek god Zeus, had conceived him with an earthly woman, which meant he would lack divine, supernatural powers. Zeus drugged his goddess wife Hera to trick her into nursing the baby Hercules (to give him divine powers). As the drug wore off, she came to her senses and flung the nursing baby from her. As she did so, some drops of her breast milk dropped to earth and sprouted to form calla lilies. The lilies were endued with god-like beauty, which made the goddess Venus jealous, so she cursed the blossom, resulting in the formation of the central spike inside the cupped bloom. Calla lilies are available year round and you may choose from a wide array of colors (especially the mini-calla): from pure white, to faint blush pink, flame-orange, mango, purple, garnet, yellow and many shades in between. Do be aware that open, cut stems contain a sap that may stain fabrics. Florists are well aware of this issue, and we take precautions to seal the stem ends, either with floral glue or stem-wrap tape. 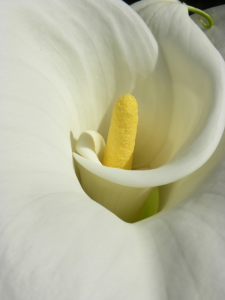 If you are looking for a flower to make a statement in your wedding, consider the calla lily. What flowers are in season, and when? As we found out in one of our previous posts, there are a few flowers that bloom in the winter, but what about the flowers that bloom in the other seasons? As you know, some flowers are “in-season” and some are not. Let’s take a look at what Spring, Summer and Fall flowers are more in-season than others so we can save you money and be in-style with the season. Tulips – this perennial flower symbolizes spring in every way. It’s colorful, pretty, and only comes around once a year. These flowers are in-season for only a little while, so if planning on having that April or May wedding, these flowers will sure to be in your bouquet. Peony – this perennial blooms in late spring, but spring nonetheless. They are native to Western North America and come in a variety of different colors, like white, red, pink and yellow. Orchids – This isn’t just one single flower, but a large family of flowers – over 20,000 to be frank. These are a spring staple, and with so many kinds of pretty orchids to choose from, they’re in-season usually all season. Rose – Although they start to bloom in Spring, they are in-season all throughout the summer. Their buds are constantly blooming in the summer and are a staple in summer weddings. With the flower meaning of love, the rose has a special place in all summer weddings. Hydrangea – take a look at gardens across Western New York and you’ll find hydrangeas popping up in the summer. These large, pretty flowers are great for accents and can fill out a beautiful bouquet. They are truly a perfect summer flower. Gerbera – Believe it or not, the gerbera is the fifth most cut flower in the world. It comes in a variety of colors and sizes, matching any color arrangement you have for your wedding. Sunflowers – Just like the rose, which begins its bloom in late spring, the sunflower is a late blooming summer flower – meaning, it’s perfect for early fall weddings. Hold on to summer during your September weddings with sunflowers. Carnation – this common bouquet flower is found in a lot of autumn weddings because of the variety of colors it comes in. Pink, yellow, red or white, the carnation is a big flower with a lot of pizazz. Magnolia – Possibly the prettiest flower of them all the, Magonlia is attractive because of its unique bulb and variety of colors. The curled pedals are attractive and stylish. Did you know there are flowers that bloom in the winter? Sounds weird considering outside right is a blanket of snow, ice with no green in sight. But these pretty flowers give the winter gloom some life, a pretty embrace to show no matter how cold it is outside, spring is just around the corner. Now some of these flowers do bloom in warmer temperatures than Buffalo, but seeing these flowers might just warm you up a little bit on a cold day. Here are four flowers that bloom in the winter. Daphnes – the Jacqueline Postill blooms in the winter mostly along the west coast. A pretty purple flower produces a great scent from its evergreen plant. 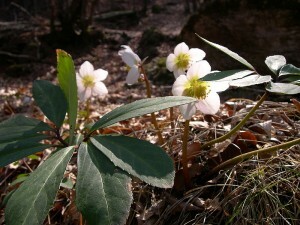 Hellebore – The Christmas rose obviously grows in the winter. This flower has a chance to grow in Buffalo, for its range is from USDA Zone 4 to 8, which is in Western New York’s wheelhouse. They grow in moist soil and can be cultivated to grow in different colors beyond white. Winter Jasmine – It’s not called the Winter Jasmine because it blooms in April, this pretty little yellow flower blooms in January in USDA Zones 6 to 10. Buffalo is in USDA 6. 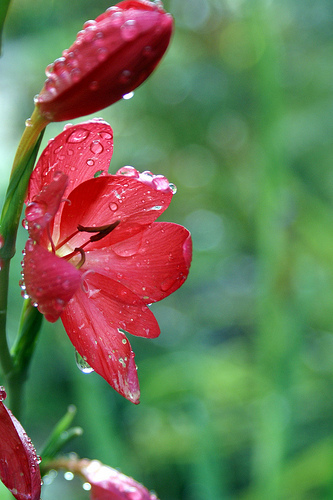 Red River Lily – HGTV says the bloom in late fall, but as we all know, late fall in Buffalo is basically winter. They are perennials that bloom in wet areas. 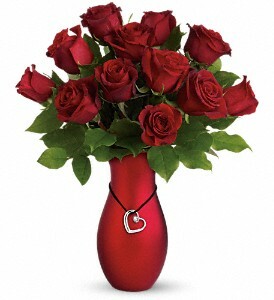 When receiving the gift of flowers, have you ever stopped to consider what they truly mean? Why were they chosen in that particular color? Was it simply preference, or something deeper? Deciphering a message behind the gift of flowers can be notably dated back to the Victorian era with the idea of “the language of flowers” or “floriography”. 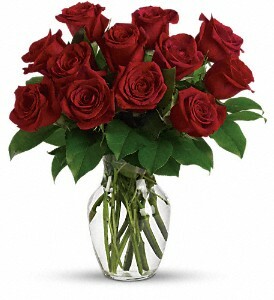 Wikipedia reports that the language of flowers was a means of communication at this time. Much like the use of floral arrangements today, these flowers, their colors and arrangements were used to express feelings to the recipient that the sender could not vocalize. While many of these meanings have since been forgotten, some still hold true. While the colors of many flowers can equally express to the recipient a message, it’s obvious the most common of these floral memos come in the form of roses. Take a look at the chart below to see what your choice of rose color actually conveys to the person you’re sending them to! While these meanings often hold true when sending a small gift to someone you care about, planning a wedding is much different. When choosing the floral arrangements for your wedding you are more likely to pick the color based on the color scheme of your wedding and less on the meaning behind that color. No matter what color flowers you choose on this special day, we at Buffalo Wedding Florist know they all represent eternal love! If you’re having trouble picking out your arrangements or colors, let us know, we’d love to help! Happy New Year!